Every catering establishment needs one especially since they make all the difference between enabling them to function smoothly or risk losing their business to their rivals. We are of course talking about commercial mixers, which are responsible for turning out doughs, batters, sauces and meringues in record time, enabling chefs and business owners to save time and keep their client base happy. In order to assist you in choosing the one which is just right for your establishment and your budget, we have provided a list of ten of the most popular appliances along with their most important features. We hope that you will find it useful in selecting the commercial mixer which will enable you to provide your client base with the experience it deserves. Certain commercial mixers come with an extra special touch which will translate into an unforgettable experience for your guests. If you intend to give your restaurant or bakery that added edge, the Presto PM-10 Stainless Steel Mixer might be a great choice to start with and you can find out all about it below. The Presto PM-10 Stainless Steel Mixer has been specially designed to handle heavy duty mixing tasks while ensuring that the product is evenly blended and aerated for extra lightness. Thanks to its 0.5 horsepower motor, you can be certain that it will be able to handle whatever you throw at it to produce awesome results. The Presto PM-10 Stainless Steel Mixer is one of the most costly appliances on this list. Its benefits include its ability to create specially aerated doughs which allow for lighter, fluffier products. In spite of that advantage, however, it actually comes with a lower capacity than similarly priced models and less attachments as well. Light, tasty deserts and snacks are one means of charming your guests and providing them with a memorable experience and this commercial mixer is certain to deliver in that regard. It also comes with the added benefit of a really efficient gear system although it is worth noting that it is one of the most expensive available. 10 quart stainless steel bowl. Wear resistant gears and shaft. Lightweight aluminum flat beater and dough hook. Far less flour capacity than models of similar cost. Commercial mixers are ideally meant to be really versatile thanks to an array of attachments which provides them with a range of different functionalities. However the best of them all are also quite robust in order to ensure they keep on running smoothly right through your busiest periods. The Thunderbird 115V-60HZ-1PH Gear Driven Mixer is one such example and we have provided a brief summary of its most impressive qualities below. This appliance comes with specially designed alloy steel gears which have been designed to provide rigorous and effective service for decades at a stretch. As a result you will be able to look forward to an appliance which will process your ingredients at the required speed. The Thunderbird 115V-60HZ-1PH Gear Driven Mixer also comes with a motor cooling system, a safety guard and a motor protector further enhancing its durability and effectiveness as a result. The Thunderbird 115V-60HZ-1PH Gear Driven Mixer is one of the most expensive appliances of this kind available on the market. However the fact that is has been designed to be particularly robust and is provided with a wide range of attachments provided makes it worth investing in. The Thunderbird 115V-60HZ-1PH Gear Driven Mixer certainly comes with a number of impressive features which include its specially designed gear system and motor protector. As a result it is certainly capable of providing robust support to your business over an extensive length of time and is worth purchasing as a result. Attachments are unsuitable for dishwasher use. Certain commercial mixers seem to have it all: a really powerful motor, an enhanced resistance to corrosion, an impressive range of mixing speeds and standard attachments. And because we believe in making everything as convenient for you, we have provide you with one which belongs in this category, the KWS M-B7 Commercial 620W Stand Mixer. The casing of the KWS M-B7 Commercial 620W Stand Mixer is made of anodized aluminum which in addition to providing it with a gleaming appeal also provides an enhanced resistance to corrosion. The appliance’s motor of 620 watts is also quite powerful making it quite suitable for the heavy duty processing which is part of the day to day operation in restaurants and bakeries. What’s more, the appliance also comes with no less than 20 mixing speeds as well an iron plate at its base to enhance its stability. All these features and more make the KWS M-B7 Commercial 620W Stand Mixer a really powerful commercial mixer which is capable of functioning in the busiest hospitality environments. In terms of price, the KWS M-B7 Commercial 620W Stand Mixer is averagely priced. However once its own range of features are taken into account, it does appear relatively cheap and more like a great bargain compared to more expensive models. If you want an appliance which does not break the bank and which will not let you down in the thick of things, you would love the KWS M-B7 Commercial 620W Stand Mixer. Especially since it comes with an extensive variety of features guaranteed to provide it with an enhanced performance. Essential set of attachments for maximum variety. An anodized aluminum casing for an enhanced resistance to corrosion. Limited capacity in comparison to more expensive models. Every chef professional baker or restaurant owner deserves the one commercial mixer which will enable them to constantly create memorable experiences for their client base. The manufacturer OrangeA believes its OrangeA Food Mixer is equal to the task. But it’s up to you to decide and we have provided all the information you need to do so below. With a wattage of370, the OrangeA Food Mixer is adequately powerful and will be able to operate efficiently to meet the needs of any bakery, pizzeria or restaurant. However it is worth noting that appliances with values almost double this amount are available, although they are more costly. The OrangeA Food Mixer is actually one of the cheaper appliances in this category. However its price is reflected in its motor and capacity which have a relatively low wattage and capacity respectively when compared with more powerful models. If you are interested in a relatively cheaper model which can be used to create a wide range of items from cakes to meringues and even dips, the OrangeA Food Mixer will meet your needs. Especially since it comes with a wire whip, dough hook and flat beater which provide an impressive degree of versatility. However it is worth noting that it is not the most powerful model available as appliances capable of handling double its capacity can also be found on the market. A 3 speed dough mixer. Flat beater, spiral dough hook and wire whip provided. One of the best ways of keeping your client base satisfied and coming back for more is by providing them with must what they need when they want it. And thanks to the right immersion blender, you will be able to instantly create appetizing soups, sauces and dips on request even when you are at your busiest, enabling you to provide them with the experience they deserve. Does the Waring Commercial WSB55 Big Stix Immersion Blender belong in this category of fantastic commercial mixers which will keep your business running smoothly? Find out below thanks to the preview we have provided. The Waring Commercial WSB55 Big Stix Immersion Blender comes with an amazing processing speed thanks to its impressive 1hp 750 watts which is one of the highest available. As a result it is capable of processing the thickest ingredients to create dips, sauces and soups in just a matter of minutes. What’s more, it also comes with a continuous on feature which makes hands free operation possible enhancing its convenience as a result. The Waring Commercial WSB55 Big Stix Immersion Blender is one of the top of the range commercial immersion blenders available although its capacity exists at the lower end of the scale. Due to these factors it is fairly expensive although it does not cost as much as other more powerful appliances belonging to the same line. The Waring Commercial WSB55 Big Stix Immersion Blender comes with all the necessary hallmarks required for efficient operation within a commercial environment including an impressive 15 gallon capacity and a 750 watt motor. It even lets you operate it hands free. These qualities in addition to a range of others mean it will be capable of enabling you to provide your clients with the experience they deserve. 18 000 rpm processing speed. Dishwasher safe stainless steel shaft. Continuous on feature for hands free operation. Capable of handling a limited range of ingredients. Some blenders have it all, a powerful motor which works like a dream, features that keep your work space tidy and the ability to produce heaps of smooth dough and silky mashed potatoes. If you are interested in getting an appliance just like that with impressive capabilities, the KitchenAid RKP26M1XNP Professional 600 6-Quart Stand Mixer is definitely worth taking a look at. Every chef has experienced the disconcerting mess which can occur when ingredients fly straight out of the mixing bowl as the mixer’s motors blast into action. However with the KitchenAid RKP26M1XNP Professional 600 6-Quart Stand Mixer you can be certain that the contents of your bowl will remain right where they belong rather than ending up all over your kitchen counter. Thanks to its unique mixing action the KitchenAid RKP26M1XNP Professional 600 6-Quart Stand Mixer will also produce doughs which ae smooth and evenly blended, enabling you to produce great tasting cakes, pizzas and breads as a result. When compared with available commercial mixers, the KitchenAid RKP26M1XNP Professional 600 6-Quart Stand Mixer is surprisingly quite cheap. Particularly since its motor is actually more powerful than certain models which are far more expensive. This fact in addition to the numerous impressive features it comes with make it a great bargain which should not be missed out on. A motor with adequate wattage, a soft start feature to minimize wastage as well as a unique mixing action make this appliance a highly efficient commercial mixer which is likely to contribute to the smooth running of your establishment. These qualities as well as its really great price make it worth considering. Soft start feature to prevent excessive wastage of ingredients. Unique mixing action for impressive results. One of the most underrated choices but nevertheless one of the most important you will have to make in the day to day running of your restaurant is selecting an efficient drinks mixer that ensures you make ice cream and mix soft drinks the only way they are meant to be – the right way. 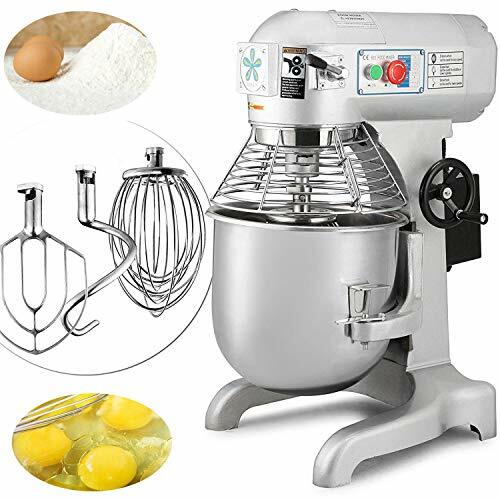 And just in case you have decided it is a decision you will like to make, we have just what you need below to get you started with the Waring mixer. 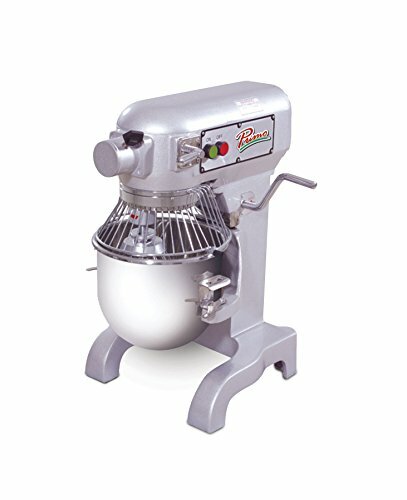 This mixer comes with 3 highly efficient motors of 1hp each which are perfect for mixing the hardest and the coldest ice-creams. What’s more it also comes with a butterfly agitator which lets you create soft serve ice cream as well as a cup slide feature which will ensure that no ingredients are wasted while each cup is set in place. Keeping those soft drinks and ice cream in constant supply is a great way of making your guests really happy a d ensuring they come back for more. And from all indicators, this commercial mixer is equal to the task of making that a reality which does mean it would be a great place to start in terms of drinks mixers which are just right for your establishment. Butterfly agitator soft serve ice cream. Three motors of 1hp each. Only suitable for use in the United States and Canada. If you own a bakery or a restaurant you will know how important it is too provide your customers and guests with fresh tasty offerings to ensure they keep on coming back for more. And that means getting a commercial mixture that will turn out what you want when it is required. The manufactures of the powerful Maxwolf Commercial Food Mixer believe that it deserves pride of place in every establishment which is serious about providing fresh tasty dishes and snacks to customers and guests. We have provided an outlined of its key characteristics below to enable you decide if it does. The Maxwolf Commercial Food Mixer comes with a 750 watt motor which is one of the most powerful in this list. As a result, you can be certain that this commercial mixer will be capable of handling the demands of your day to day business needs really effectively, enabling you to turn fresh ingredients into tasty doughs, sauces and batters. Due to its extremely powerful motor which comes with one of the highest wattage values available, the Maxwolf Commercial Food Mixer is pretty pricey. However its motor is far from the only thing which is noteworthy about it especially since it also comes with a wide range of attachments which will enable you to provide a wide variety of freshly made offerings for your clients. With a 20 quantity bowl capacity and 750 watt motor, the Maxwolf Commercial Food Mixer is perfectly capable of meeting the needs of your establishment. The three attachments it comes with also ensure it will provide any sauce, dough or even batter you need. As a result, it is worth investing in to ensure the smooth day to day running of your business. 5 kg maximum flour capacity. Spiral dough hook, wire whip and flat beater provided. Gear system may be expensive to maintain. When it comes to selecting that appliance which will provide you with efficient standard service, your best bet is relying manufacturers which are renowned for delivering in that regard. And that is what makes the home appliance provider uniworld an ideal choice since it prides itself on the efficiency of its products like the Uniworld 10QT Commercial Stand Mixer which is covered in detail below. Commercial mixers with gears have the added advantage of being able to deliver a constant output. However what makes the Uniworld 10QT Commercial Stand Mixer really unique are its gears which have been designed with mesh heat treated alloy steel further enhancing their effectiveness and the ability of the appliance to handle heavy workloads as a result. As expected for a rather impressive appliance, the Uniworld 10QT Commercial Stand Mixer can be found at the higher end of the price scale. That means you can look forward to an item which delivers constantly in terms of efficiency and output although its capacity is lower than a number of similarly priced items. Considering all its qualitied which have been covered above, it is clear that this commercial mixer is capable of living up to expectations in terms of its efficiency particularly due to its effective gear system. Hence it is an ideal option for anyone interested in an appliance that will stay the course during really busy periods. Less capacity and attachment variations than similarly priced models. Commercial mixtures are expected to come with a standard set of attachments which let you knead, whisk and beat your ingredients into the right consistency. however quite a few actually let you add a few more attachments of your own making the sky your limit when it comes to creating an endless variety of dishes and desserts with which to delight your guests. A great example of such a fantastic appliance is the KitchenAid Professional 600 Series KP26M1XER Bowl-Lift Stand Mixer and we have provided details on it below. This commercial mixer has been power hub provides you with the option of using no less than 12 attachments. As a result the possibilities are simply endless. You can create really fine fresh pasta, delicate, light meringues or shred a huge amount of cheese in incredibly short time providing your prepping options with an additional touch of efficiency. The KitchenAid Professional 600 Series KP26M1XER Bowl-Lift Stand Mixer is actually a cheaper model in comparison to a number of more powerful appliances which have already been covered. The fact that it is competitively priced and really versatile makes it an appliance which is worth adding to your kitchenware appliance collection. With an attachment hub which lets you add a maximum of 15 attachments, the KitchenAid Professional 600 Series KP26M1XER Bowl-Lift Stand Mixer is definitely one of the most impressive models available. Its 67 point planetary mixing action and corrosion resistant bowl are also added bonuses. If you want a commercial mixer which will provide an added dimension of flexibility to your kitchen while looking great at the same time, you will love the KitchenAid Professional 600 Series KP26M1XER Bowl-Lift Stand Mixer. 6 quantity stainless steel bowl. Limited capacity of mixing bowl. Q: What features should an ideal commercial mixer have? For starters, a powerful motor is really important since it determines the ability of the mixer to handle really large workloads. It should also come with the three main attachments which consist of a dough hook, wire whip and dough beater. Q: What are the best brands to consider when purchasing a commercial mixer? Brands which are household names such as Kitchenaid are generally a great option to consider. However other brands might also yield unexpected surprises since it is possible to find averagely priced mixers from lesser known brands which come with really impressive features. Q: What attachments usually come with a product vs what I have to buy separately? Most models will come with a basic set of attachments used for the most common tasks. These typical agitators include a spiral dough hook, traditional mixer (beater), and wire whipper. Meat grinders and different styled beaters are also available. It’s always good to confirm, but the power hub of each product will usually accept standard sizes (GS-12 for front hub), so even other manufacturer’s attachments can work. This is good to note as it may be hard to find commercial mixers with full attachments. Q: Are commercial mixers suitable for restaurants only or can they also be used in a domestic environment? There are a number of commercial mixers which can be used in a domestic setting, however it is worth taking their capacity and size into consideration to ensure that they fit perfectly into your kitchen.